Since its introduction in 1986, over 70 million American Silver Eagles have been bought by wise collectors and investors. Silver Eagles have become the most popular bullion coin in the world because of its beauty, its quality and the assurance of content by the U.S. Government. The design is based on the famous “Walking Liberty”of Adolph Weinman’s 1916 U.S. half-dollar, widely considered to be one of the most beautiful coins ever minted. Every Silver Eagle is a meticulously crafted work of art, produced to the exacting standards of The United States Mint. 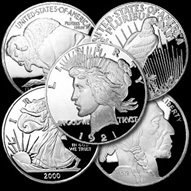 By law, all U.S. Silver Eagle bullion coins are struck only from silver mined in the United States. Since its introduction in 1982, the Silver Panda Coin has become firmly established in a place of prominence in the world of coin collecting and investing. The obverse has been redesigned each year (except for 2002) reflecting a different view of the giant panda in his natural habitat, the bamboo forests found only in China. The beauty of each new design and its guaranteed purity has added to its appeal.. The reverse of the coin depicts Tien Tien, The Temple of Heaven, the oldest temple in Beijing and remains unchanged except for the date from year to year. We carry a diverse mix of silver rounds from numerous manufacturers such as Sunshine Mining, U.S. Assay, A-Mark, Silvertowne, Engelhard, Johnson Matthey, and other comparable quality manufacturers. All are Hallmark stamped with their exact purity of contained silver from their issuer. NPMG guarantees you will receive only .999 fine silver rounds. Many times we ship various designs with each shipment. Bars and rounds of any size are an excellent way to invest in pure silver while avoiding the premiums usually found on legal tender bullion coins. They are easily bought and sold, stored, stacked and counted. *Most of these items can also be purchased and placed inside an IRA account for retirement. Call us for details. The Engelhard hallmark is one of a select few symbols that assure the ability to sell or buy silver with absolute confidence no matter where in the world the investor is. Engelhard, one of the oldest names in precious metals, has built an enviable reputation for producing purity and quality in bullion bars and investors know that they can rely on 100 ounce silver bars by Engelhard to be accurately stamped with the exact purity of the contained silver. Weight: 100 & 1000 troy oz. Many investors know that the most efficient way to obtain pure silver is in the form of 100 and 1,000 ounce bars. However, in order to guarantee purity, that bar must bear the hallmark of a reputable, instantly recognizable refiner. Johnson Matthey 100 ounce silver bars are always acceptable to the most discerning investors. From its founding in 1817, Johnson Matthey has created an unrivalled position in all precious metals, based on specialist knowledge and technical excellence. Johnson Matthey silver bars are one of the world’s most widely recognized and secure investment instruments because the universally recognized hallmark assures almost instant liquidity throughout the world. Weight: 100 & 10000 troy oz. Bags of U.S. circulating legal tender coins (dimes, quarters, half-dollars) containing 90% silver or 40% silver are traded based on silver weight. All bags contain $1,000 face value of the coins and a “90% bag”may contain 10,000 dimes, 4,000 quarters or 2,000 half-dollars or a mixture of dimes, quarters or halves that total $1,000 face value. All “90% coins”are pre-1965 because prior to 1965, all U.S. dimes, quarters and half-dollars were struck from an alloy containing 90% silver and 10% copper. In 1965, at the direction of Congress, the U.S. Mint removed all silver from dimes and quarters. Silver content in half-dollars was reduced to 40%. Each 90% silver bag contains either 4,000 U.S. quarters or 10,000 U.S. dimes dated 1964 or earlier...weighs approximately 800 troy ounces (or 54 pounds)...and contains approximately 715 ounces of pure silver. One of the primary benefits of a 90% silver coin bag investment is that the bag has a built-in guarantee simply unavailable with most other silver investments: No matter what happens to the price of silver, the value of your 90% silver bag will never be worth less than its $1,000 face value. In 1965 the U.S. Mint removed all silver from all dimes and quarters and reduced the silver content in Kennedy half dollars from 90% to 40%. Actually, the mint changed the alloy from which the coins were struck using a base metal alloy for the core and adding a silver coating to the outside of the coins. These Kennedy halves (1965-1969) are known as “clads”because they are clad in silver. 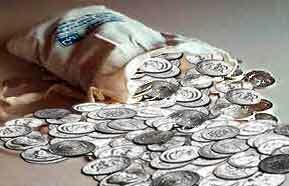 After 1969 all circulating U.S. coins were struck without silver. 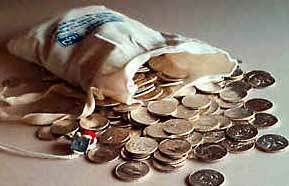 A “40% Silver Bag”consists of 2000 Kennedy half dollars minted between 1965 and 1969. Buying 40% silver clad coins from NPMG makes sense, now more than ever before. $1,000 face value bags of 1965 to 1970 Kennedy half-dollars are real money. You can spend them anywhere. They are convenient, transportable and will never be worth less than their face value—no matter what—guaranteed. Each $1,000 face value clad bag includes 2,000 Kennedy half-dollars, which contain approximately 295 ounces of pure silver. You can hold or trade these bags in units...or the coins can be sold or traded off in smaller quantities, making them extremely liquid and convenient to buy and sell.